Treat yourself and your family this festive season by choosing from a great selection of cottages and self catering apartments across the UK… you will be spoiled for choice! 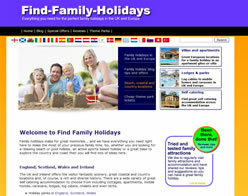 Secure your favourite holiday, book your Christmas or New Year break now as time is running out! This Christmas and New Year selection is providedby our partners Hoseasons, but you can find lots of other great cottages and self catering available over the holiday period in the Find-Family Holidays listings for England, Scotland,Wales and Ireland. Ir why not spend the festive period in France? Book a Christmas or New Year week and save over £250 at this luxury ground floor marine apartment over looking the Thurlestone Sands beach. Relax in the comfortable living room and enjoy the stunning views out to sea. Now only £799 per week, under £20 per person per night, based on 6 sharing. £75 off a Christmas or New Year break at this delightful property in a stunning location adjacent to the Championship course at Dartmouth Golf and Country Club. Enjoy free access to the Lakeside Health and Beauty Suite within the clubhouse where facilities include an indoor leisure pool. Just 4 miles from the famous naval town of Dartmouth, this thatched stone cottage is perfect from which to explore the beautiful South Hams, now only £775 per week, under £28 per person per night, based on 4 sharing.